The Warriors will be the first team to play five All-Stars from the previous season since the 1975-76 Celtics when DeMarcus Cousins logs his first minutes as a Warrior on Friday against the Clippers. I got 4 of the 5. Can you name them all? The top three should be super easy. All 5 super easy really, if you were around back then. When DeMarcus Cousins logs his first minutes as a Warrior on Friday against the Clippers, the Warriors will be the first team to play five All-Stars from the previous season since the 1975-76 Celtics. I was not and I missed Charlie Scott. that's easy - Cowens, JoJo, Havlicek, Charlie and Silas, Kuberski was a sometimes starter when they would play Silas in the valuable 6th man role that Ramsey and Havlicek made famous in the 60's. 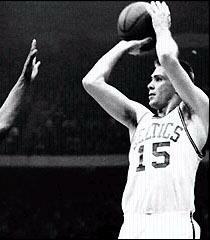 I love Charlie Scott, but never understood why Red traded Paul Westphal for him after Don Chaney left in free agency. That group should have had 4 titles in a row, '73 Havlicek was hurt in the playoffs and '75 I'll never quite understand losing to the Bullets in the ECF. They were very good and really handled us, not sure what happened.